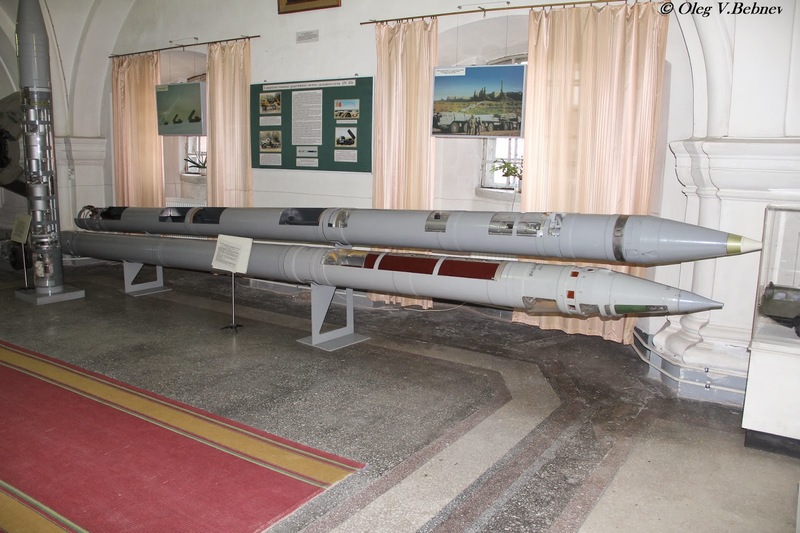 As the Armament Research Services website details, these are unexploded 9N235 fragmentation submunitions, deployed by 9M55K rockets, fired from the BM-30 Smerch and 220 mm 9M27K1 rockets for the BM-27 Uragan MLRS. 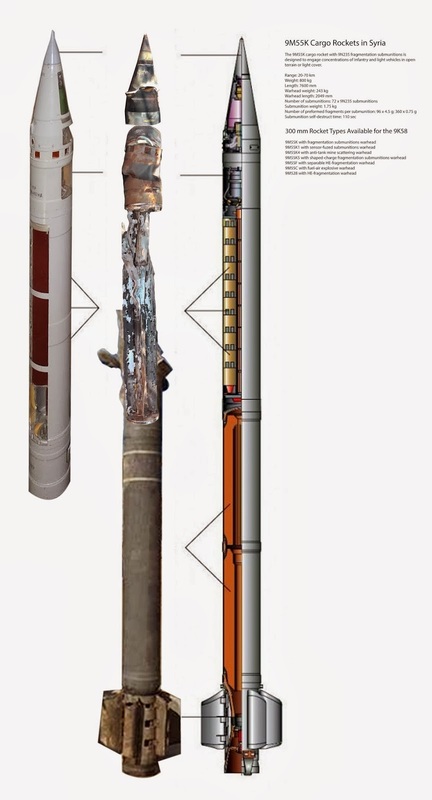 Considering the remains of a nearby 9M55 series rocket, it seems very likely those rocket remains would be the 9M55K. Thanks to Mads Dahl for highlighting the two images in this post. A special report by Elijah J Magnier on the ongoing Yabrud Offensive. His earlier report on the opening stages of the Offensive can be found here. 207 rebels were killed in the first week by over 45 air raids, Kornet missiles, tanks and artillery. It is not the battle of Yabroud but the battle of Al-Qalamoun. Regular Syrian Army Forces, along side with Hezbollah Special Forces, initiated this week a ground attack against Al Qalamoun occupying strategic position and attacking cities around Yabrud. None of the forces engaged consider it is going to be an easy walk. The attacking forces describe the topography of al-Qalamoun, with its mountains and hills, as the ‘Syrian Tora-Bora’, referring to the infamous Afghan mountains. Over 45 air raids were carried against the rebel’s position in the area so far. More than 207 rebel fighters were killed. All three arms (ground, air, artillery) are fully engaged on the front line. Hezbollah claim that all car bombs are prepared in Yabroud, driven to Arsal and into its stronghold in the Bekaa and the suburb of Beirut. A few days prior the beginning of the attack, Shaikh Naim Qassem, vice Secretary general of Hezbollah, explained that ‘it was necessary to put an end to the car bombs coming from Yabrud’. Sayed Hasan Nusrallah, Hezbollah Leader, will be tomorrow evening on Al Manar TV to talk about the newly formed government; the Takfirees operation in Lebanon following the arrest of Naim Abbas, a commander of the Al-Qaeda affiliated Abdullah Azzam terrorist group; to prepare the Shia community for the lost of lives Hezbollah will suffer in Al-Qalamoun battle as he did prior the battle of Quseyr and during Hezbollah full engagement in Syria since May 2013. East: Syrian troops and artillery are deployed East of Yabrud on all strategic positions and hills overlooking Yabroud, from Al Nabak to al-Qastal where Rima farms, Yabrud and Ras al A’yn are under artillery fire control. This is essential to avoid any tactical withdrawal of the rebels toward rif-Dimashq. North: The front attack has started from the North of Yabrud where the main attacking forces moved from Nabak toward Rima Farms. 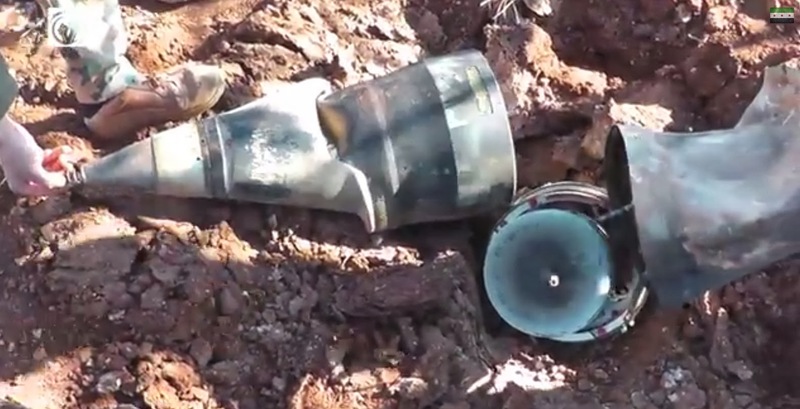 Strong firepower was used to bombard rebel’s position. The advance forces are also supported by the artillery positioned East of Rima Farms contributing in pounding the farms. Until today, half of Rima farms have been re-taken. No civilians inside Rima farms. Thousands left the area toward the Syrian position prior the battle. These are neutral families. Others, the families of the rebels, were divided between those who left to Arsal (Lebanon) and others toward Yabrud. West: The main battle is in the West to support the Northern-front attack toward Yabrud. This is where the main military operation is engaged. On the West side, troops were deployed on the mountains and roads between Lebanon and Syria. Four of the six official roads are today fully under control. The remaining two roads are today under fire control and will be soon closed. No vehicle can cross between the two borders. There are ten unofficial roads between Lebanon and Syria, leading to the Lebanese city of Arsal. All these roads are today fully under control. The attacking forces are using smugglers of the area to identify all possible existing paths and caves. On the other hand, ground troops managed to enter both Al-Jarajeer and Al-Sahel. The battle is ongoing now in the surrounded city of Falita, under heavy bombardment. Nonetheless, notorious inhabitants of Falita asked to negotiate an exit for rebels. The city of Falita is completely surrounded. Inhabitants were asked to gather all weapons in one accessible place for the attacking forces and to raise the Syrian flag is they agreed to surrender. The attacking forces will not enter the city unless the road is completely cleared. We have spotted 6 vehicles with armed rebels going from Falitah toward Yabrud. 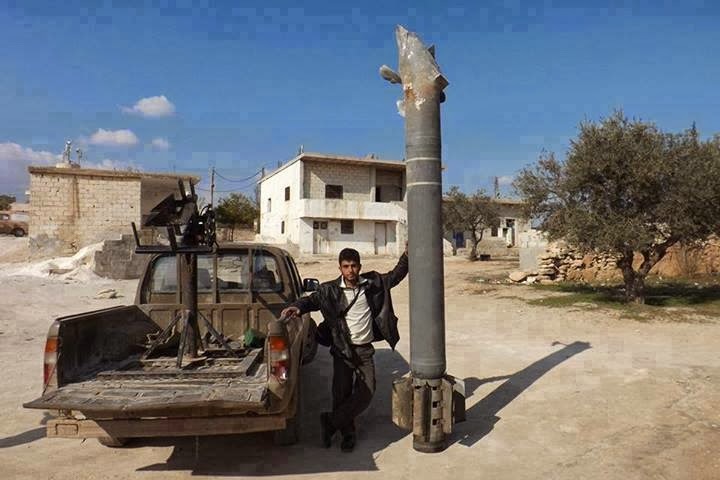 Anti-tank 9M133 Kornet missiles destroyed these. Hezbollah has effectively used the laser guided missiles Kornet in 2006 war causing heavy loss among the best Israeli tanks, the Merkava. Always on the West, the attacking forces are advancing on the easier landscape between Falita and Rima Farms, closing the wing on both Rima farms and Yabrud. There is no close contact with the rebels in this area, allowing the artillery to open the road ahead of the ground forces. South West: On the South West of Yabroud, there is the city of Ras Ma’ara. Forces are advancing North toward Ras Ma’ara to close the road to Yabrud. West of ras Ma’ara there are the Lebanese Shia area of Nahle, Baalbeck, Nabi-Sheet and others, preventing any infiltration into Lebanon. When asked about the same experience Hezbollah faced in Quseyr allowing some of the rebels to withdraw to fight these later in other places, the source explained: “We're constantly revising our plans according to the battle field necessities. If all the rebels decide to stay, we shall face these. This is what we came to al-Qalamoun for. The style of attack has changed. First we use air force, artillery and tanks power. Ground troops come last. Rebels will be completely trapped inside if we decide to close the passage later. Ground troops will enter when little resistance remains. If the rebels decide to leave, we occupy more land (Yabroud/Qalamoun) with less loss and we shall face these some other time in the battle field if they still have the will to continue fighting”. 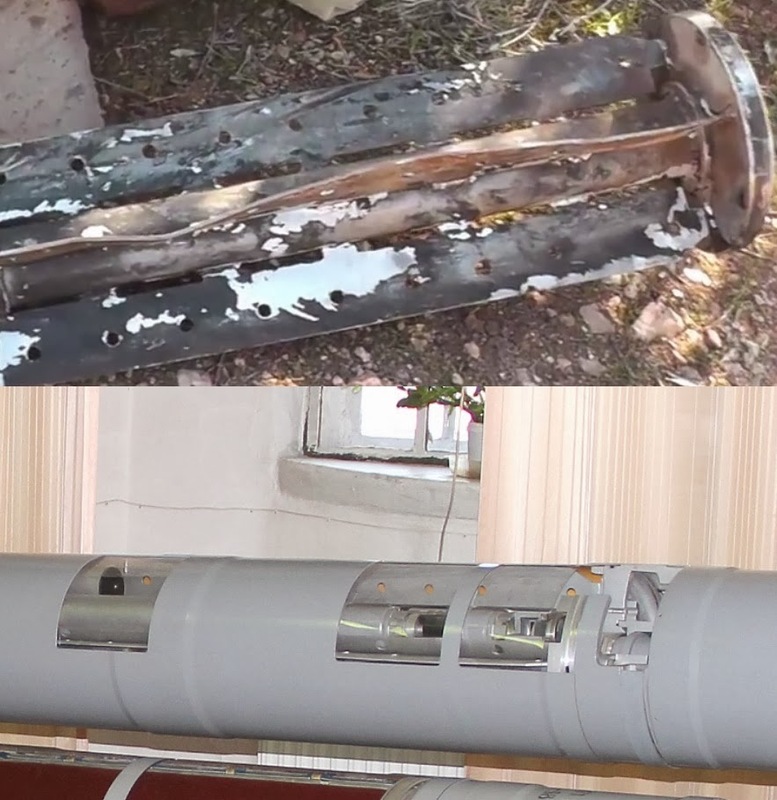 The remains of the rocket were much larger than any air-dropped cluster munitions used by the Syrian air force, so I took at a look at the multiple rocket launchers used by the Syrian military. The BM-27 Uragan is the largest multiple rocket launcher system I could find that open source information suggested was being used by the Syrian military, but the 220mm calibre of the rockets seemed far too small for what was seen in the above images. 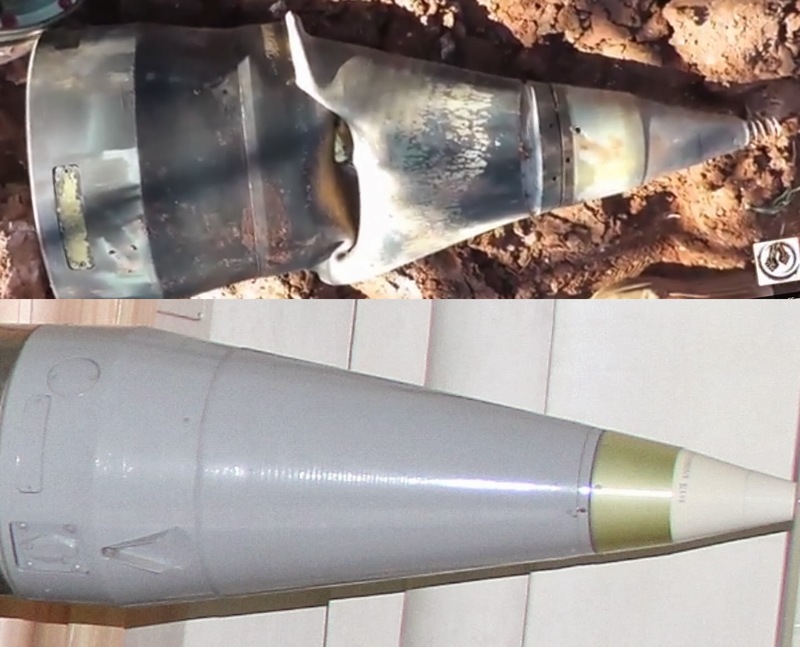 I compared the foot in the top left corner of the above image to the width of the rocket, and from that it was clear the rocket was closer to 27-30cm wide than the BM-27's 22cm calibre. 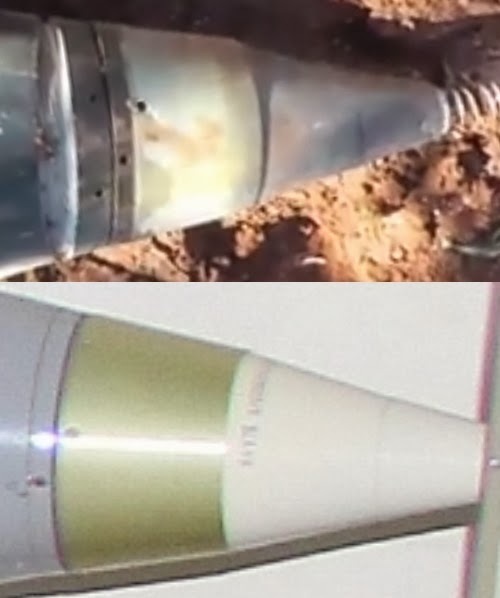 Based on this, and other images, it seems certain the remains of the rocket in the video is from the 9M55K range of cluster munition rockets, launched by the BM-30 Smerch. 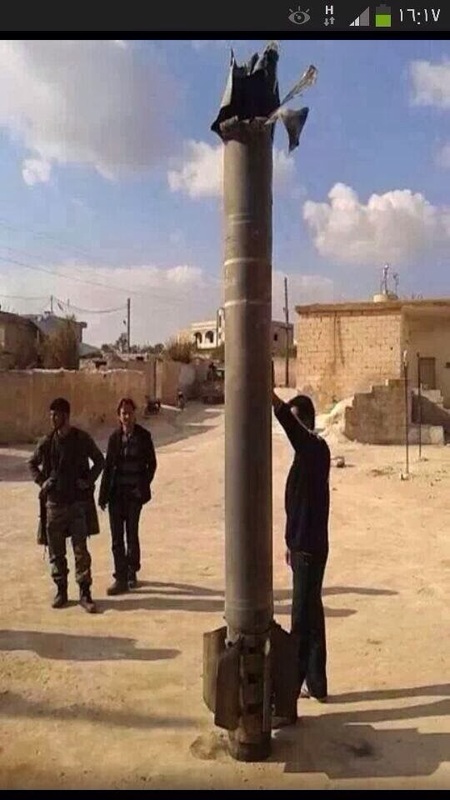 While there's no open source information that suggests the Syrian military has this system, it seems unlikely that the rocket could have come from any other source. 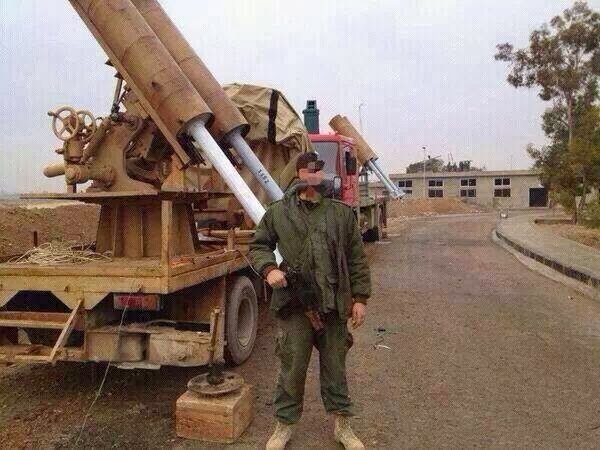 With a range of 90km, it not possible to know what the point of origin was, but it does appear to be the first evidence that the Syrian military are using BM-30 Smerch multiple rocket launchers in the conflict. Thank to Chris Kabusk for help with this article. Also thanks to Bente Aika Scheller, author of The Wisdom of Syria's Waiting Game. Foreign Policy under the Assads, whose donation to last years Indiegogo campaign helped keep this blog going. Hezbollah, supported by Syrian tanks, artillery and air raids, has started this morning a large scale battle advancing toward the city of Yabrud in the Qalamoun, close to the Lebanese-Syrian border. Cut the supply line between Lebanon (Arsal) and Syria where rebels have safe heaven. Protect Damascus and its rif. Divide, through future military operations, the North from the South of Syria. Hezbollah used in this attack self-made Volcano (Burkan) rockets to advance on the ground from Nabak and Deir Atiya re-taking Al-Jarajeer and all the surrounding hills between Lebanon and Syria. As this article is published, the battle is ongoing in Mazare Rim. The next stop is Fallita before heading toward Yabrud. Hezbollah has learned its lesson in Qusayr: “No more safe exits for rebels” since more than a thousand of them escaped towards Qalamoun. Today, Hezbollah has to fight against those same rebels once more. A senior leader in the joint operations room, run by Hezbollah and the Syrian regime, said that "the Special Forces started their ground attack on all axes at the crack of dawn. Hezbollah intelligence unit, through meticulous under-cover operation, has gathered detailed information on the number of rebels, where their command centers are, and what is their capability and readiness to fight." The source said: "After gathering all necessary information, we launched the attack, which coincided with the anniversary of the martyrdom of Hajj Imad Mughnniyeh, Sayyed Abbas Musawi, Sheikh Ragheb Harb and all those who fell by the extremist's car bombs sent to Lebanon. Our message to these: Nahnu Qadimun (We are coming)". "The battle of Qalamoun will be run differently from the one of Qusayr: Far more intensive fire power to reduce loses and inflict more damage to the rebels. We shall block entry to the city and villages from all access and directions. The advance of the Special Forces (SF) will progress from six different axes to separate the rebel lines and isolate them into smaller groups." explained the source. He pointed out "Hezbollah SF who have participated in the battle of East Ghota, Idlib and Qusayr have been deployed in the battle with their experience and full equipment, including their special Burkan (Volcano) to open the road." The source said that, according to their intelligence information, there are "some 200 Lebanese fighters under the banner of the extremist groups, while the rest is divided as follows: One third Saudi, one third from different Gulf countries including Palestinians and one third Syrian, mainly under Jabhat al-Nusra’s command". According to this high ranking military commander, it is "difficult to predict how long the battle will last, none the less, Yabrud will surely take less time than Qusayr which is no more than two to three weeks". In relation to the 12 nuns kidnapped by the extremists, the source was aware of the kidnappers request and revealed "the extremists asked to stop the battle against Yabrud and to release 500 extremists from the Rumiyeh jail and from Syria. This is unacceptable since each one of these will return to fight again. We hold the extremists responsible for the safety of the nuns". “We continue our reporting attacks,” read a typical post from December 9 on the SEA’s Facebook page. “Our next target is the Local Coordination Committee of Barzeh [a neighborhood in Damascus], the page that is a partner in shedding Syrian blood and provoking sectarian division.” It then provided two links to photos on the Barzeh page that could get the page taken down. Soon afterwards, the SEA removed its post as if it had never existed. These deletions mean a vast amount of information is being lost, including initial reports of various events, photographs, and videos. But how do we get a sense of how much information is being lost? In recent weeks, I've been working on a project to gather and analyse all the information I can find relating to the August 21st Sarin attacks in Damascus. This has included collecting a list of YouTube channels posting videos relating to the attacks, many of which have Facebook pages linked in the video descriptions. To understand how much information is being lost, I've reviewed each channel, and detailed the status of their related Facebook pages below. Abdullah Alshamy - No linked Facebook pages. Coordinating Kvrbtna - Current page, Coordinating.City.KafrBatna, created November 2013. Earlier page, kafrbatnasy, deleted. Darya Revolution - Current page, D.M.C.Daryya, created January 2014. Earlier page, MCDDaryya, deleted. erbeeni/erbin revo/erbinmedia1/MrERBEEN2011 - Current page, Erbinrevo2011, created November 2013. Earlier page, erbin2011revolution, deleted. Fadi Abdallah - No linked Facebook pages. free syr - No linked Facebook pages. Information Office of the consolidated city Arbin - No linked Facebook pages. Jobar Revo - Jobar.Revolution deleted. lcc douma - Douma.Revolution.lcc created in February 2013. MajlesRifDimashq - No linked Facebook pages. Mehmed - No linked Facebook pages. Mohammed Saeed - No linked Facebook pages. Network is always free - Damascus - No linked Facebook pages. SaqbaRevo0 - No linked Facebook pages. Sham Media Foundation appeal - Foundation.Nidaa.Alsham created April 2013. 9 channels have no Facebook links. 7 are linked to Facebook pages that are now gone (some of which have new replacement pages created after August 21st), with 2 linked to existing Facebook pages. That means 78% of Facebook pages that could have included initial report about the August 21st attack, and relevant photographs and videos, are gone. Compared to the hundreds, if not thousands, of YouTube pages linked to Facebook pages, this is a small sample size, but relating to the one event that took place on August 21st, this represents a extremely significant amount of information. The question for Facebook is how they see their role in the world. Social media is being used as a place for both sides in the Syrian conflict to get their message out, and sometimes that includes unique and important information. This has lead to an online information war, with both sides attempting to eliminate each other from the internet, with data on war crimes and key events in the conflict being the collateral damage, if not the intended target. Facebook has a choice, develop it's policies to take into account the changing way in which online communities and social media are being used in relation to conflicts, or to be just another place where people can share pictures of their latest meal and funny cat pictures.